Reticulated polyurethane filter foam does exactly what its name implies. Open cell foam filter allows for the passage of air while filtering our dust, debris, insects and more for a cleaner living space inside the recreational vehicle or motorhome. Reticulated urethane foam is a porous, low-density substrate typically provided at a density of 20 PPI (pores per inch). Additional grades are available by request. 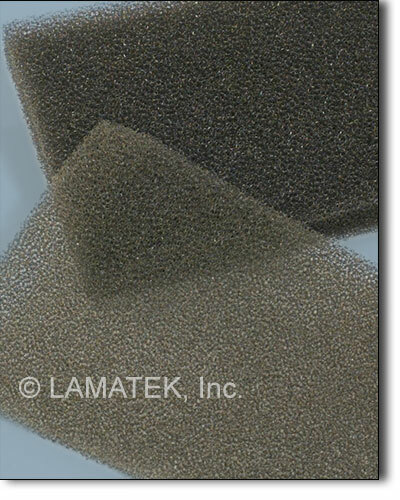 Filter foam is gray in color and available in a variety of thicknesses. Our polyether urethane offers excellent compression recovery and cost effective filtering. UL-94 rated polyester foam is a self-extinguishing urethane best suited for applications that require moderate UV exposure and minimal compression. Filter foam is non-adhesive. LAMATEK filter foam is typically provided in individual pieces or sheets that are cut to your specification to fit virtually any filter size and shape. Choose from our library of existing parts or send us your dimensions and let us do all the work! Our engineering team can design the perfect part for your recreational vehicles. The word “reticulate” comes from the Latin reticulum, meaning “small net.” So if you were to look at filter foam under a microscope, you’d see a complex pattern of open cells large enough to allow air, water and vapor to flow through but small enough to trap dust and other irritants.